The New Old Age: When Is the Surgeon Too Old to Operate? In the fall of 2015, Dr. Herbert Dardik, chief of vascular surgery at Englewood Hospital and Medical Center in New Jersey, nodded off in the operating room. Note that Dr. Dardik, then 80, was not performing the operation. He’d undergone a minor medical procedure himself a few days earlier, so he’d told his patient that another surgeon would handle her carotid endarterectomy, in which plaque is removed from the carotid artery to improve blood flow. But when she begged Dr. Dardik at least to be present during the operation, he agreed to sit in. “I was really an accessory,” he recalled. “It was so boring, I kind of dozed off” — whereupon an alarmed nurse-anesthetist reported the incident to administrators. Within days, the hospital’s chief of anesthesiology and chief medical officer were in Dr. Dardik’s office, praising his surgical skill while urging him to reduce his workload. He also resisted the suggestion that he undergo testing at Sinai Hospital in Baltimore, which had established a two-day program to evaluate whether older surgeons could safely continue practicing. A few weeks later, he became the first doctor evaluated by Sinai Hospital’s aging surgeon program. The physician work force, like the rest of the population, has grown substantially grayer in recent years. Almost a quarter of practicing physicians were 65 or older in 2015, according to the American Medical Association. In 2017, more than 122,00 physicians in that age group were engaged in patient care. Health care researchers and analysts are debating what, if anything, to do about this tide of aging practitioners. 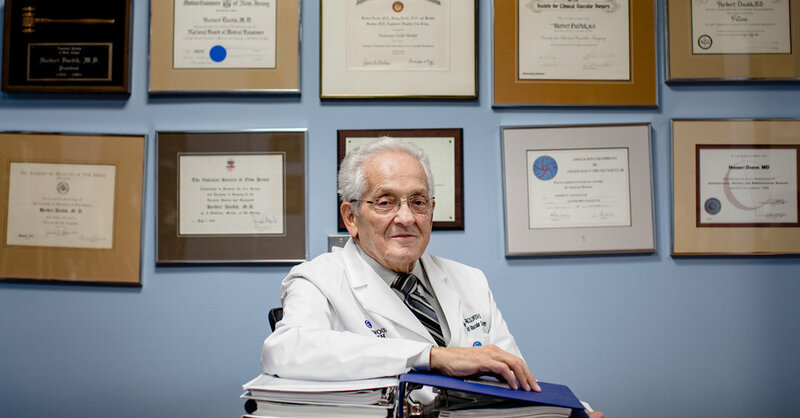 “We know that human faculties decrease with age,” said Dr. Mark Katlic, the thoracic surgeon who founded Sinai Hospital’s program. Declining vision, hearing and cognition can affect any health professional (or any human). But Dr. Katlic has expressed particular concern about surgeons, who need to retain exceptional vision, manual dexterity, reaction speed and stamina. Past age 70, “can you grab a tiny little blood vessel with a forceps and not grab something else?” he asked. “Or use very small instruments for sutures?” Some operations, he pointed out, go on for six or seven hours, even longer. Studies haven’t produced clear-cut answers to such questions. Cognition and other abilities decrease with age — but the variability between individuals increases. At 75, “there are sharp, wonderful doctors, and those who need to stop,” said Dr. E. Patchen Dellinger, lead author of a review on aging physicians published in JAMA Surgery. Whether older surgeons have poorer outcomes than younger ones also remains debatable, because decades of experience and judgment can compensate for modest physical or cognitive declines. One large study of Medicare patients found surgeons over age 60 had higher mortality rates for several kinds of operations, including coronary bypasses, but for not other procedures. And the differences were small, occurring mostly among doctors who performed few operations. Last year, conversely, researchers reviewing records for nearly 900,000 Medicare patients reported that operations by older surgeons resulted in lower mortality than those by younger physicians. A 2016 statement from the American College of Surgeons, for instance, recommended physical, visual and neurocognitive testing for older surgeons — but on an entirely voluntary basis, with no requirement that they disclose the results. Becoming a surgeon is difficult, a grueling marathon. But remaining one isn’t very demanding, experts say. Regular hospital re-certification tends to be perfunctory. Peers often fail to report troubling behavior, especially since senior physicians can be powerful, respected figures. Doctors resist suggestions that they slow down or walk away, added Dr. Glen Gabbard, a psychiatrist at Baylor College of Medicine who has specialized in psychological evaluations of doctors. A mandatory retirement age could solve such problems. But it also could violate discrimination laws, sideline perfectly competent doctors and leave rural communities even more underserved. Advocates argue that mandatory screening at older ages represents a better approach, a way to distinguish able senior professionals from those who should retire, reduce their responsibilities, or transition to teaching and other roles. A handful of hospitals have already adopted that tactic, including the University of Virginia Health System, Temple University Hospital and UPMC in Pittsburgh. Late-career practitioner policies, as they’re often called, kick in at age 70 or older and typically cover not only physicians but nurse-practitioners, physician assistants and other professionals. The Society of Surgical Chairs, representing leaders at academic medical centers, may boost such efforts in the next few months when it publishes a new white paper, “Transitioning the Senior Surgeon.” Dr. Todd Rosengart, the society’s president, expects the report to spur wider discussions. But for now, the number of institutions that have taken any formal action related to age remains tiny. In its fifth year, Sinai Hospital’s assessment program has screened a grand total of eight surgeons, ages 55 to 81. As the first, Dr. Dardik found the testing arduous but did well. The program’s report indicated that he could capably continue operating. When the assessment team discussed his performance, “most people said, ‘If I needed a short vascular surgery, like a carotid endarterectomy, I’d have him do it,’” Dr. Katlic recalled, though for extended operations, they might opt for someone younger. Back at Englewood, however, Dr. Dardik began experiencing intensifying back pain. Worried about distractions in the O.R., he voluntarily stopped performing surgery in 2016. Now 83, he still comes to the hospital every weekday, but has shifted to research, teaching and mentoring.